This review first appeared in the May 8, 1992 edition of the North County Blade-Citizen (now North County Times). There's a heck of a lot good, good country music being played out there that you won't find on the radio. Add Iris DeMent to that list. She's as traditional as they come, but never sounds hokey. She's a songwriter as well as performer, too, a habit getting more and more rare in Nashville. 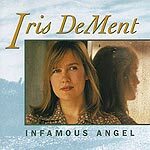 While it's conceivable that DeMent's voice, twangy as it is (like a female counterpart to Jimmie Dale Gilmore), might be grating to some, her songwriting is absolutely stellar. Whether it's the rocking "Hotter Than Mojave in My Heart" or the ballads "When Love Was Young" and "Our Town," DeMent shows a real talent at writing beautiful melodies and complementing them with meaningful, poetic lyrics. It is, apparently, a family affair, this DeMent knack for music. On "Mama's Opry," DeMent (backed by Emmylou Harris on harmony vocals) pays loving tribute to her mother's role in shaping her love of music, as well as her mother's dream of someday singing at the Grand Ole Opry. On the traditional spiritual "Higher Ground," she gives her mother, Flora Mae DeMent, that chance at fame, and it is as evocative and emotional a performance as one will come across on vinyl. It is, in fact, worthy of the Carter family Iris lauds in "Mama's Opry."